Nick Schwab, the founder of Invoked Apps, is the mind behind the most reviewed skills on Alexa and Google Assistant. 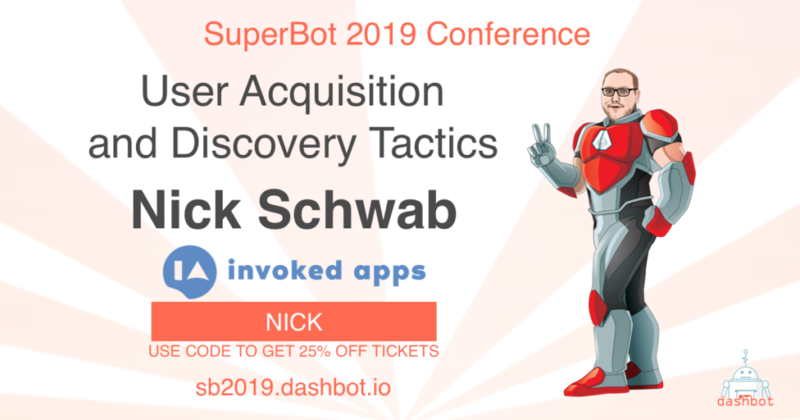 He’ll be speaking at SuperBot this year on how he acquires new users in his voice skills. Nick spends his days as a Senior Software Engineer at Ford Motor Company where his contributions help power the underlying app-to-vehicle connectivity of the iOS and Android “Ford + Alexa” apps, which bring the convenience of Alexa into many SYNC 3-equipped Ford vehicles. Passionate about a voice-first future, Nick spends the remainder of this time developing Alexa Skills and Google Actions as the founder of Invoked Apps. Nick‘s company is best known as the author of ambient sounds for sleep and relaxation on Alexa and Google Assistant, reaching over 2 million users every month. To date, skills by Invoked Apps are collectively the most-reviewed skills on Amazon Alexa and have some of the highest overall ratings on both platforms.